Houston's all about slowing things down, from hip hop that'll leave you feeling screwed up, to a no-longer-expansion football franchise whose slow rate of ascent just leaves you feeling screwed. Bucking the trend by speeding things up, Hamilton Shirts. Established in 1883, this Houston bespoke dress-shirt maker has just unleashed their first ready-to-wear collection, giving the ability to bask in their legendary craftsmanship to the impatient/poor. 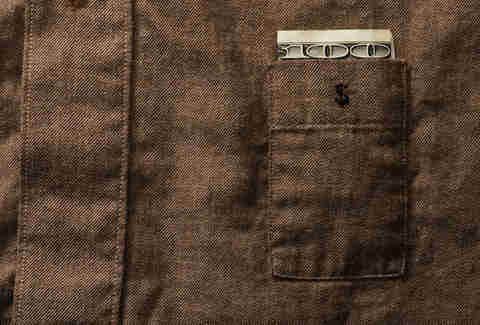 New into Stag are shirts that take inspiration from one-off past jobs, from the Field, with built in shooting pads and ammo pockets, to the Cash, with money pockets built into the shirttails -- originally commissioned by a paranoid 1930s banker, apparently the one person back then with cash to cleverly conceal. 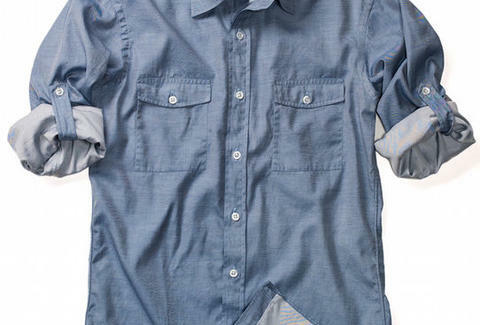 Online for the taking (or back-order) is a three-button, "Italian double-ply fabric" pullover (in blue chambray, white w/ brown check, or navy gingham), same-fabric Western shirts one thankfully couldn't imagine mucking a stall in, and a classic Oxford in white, blue, or red stripes, with a chest pocket specially sewn to hold a pen, or if you're just that sweet, a laser pen. Although ready-to-wear is their new pride and joy, Hamilton's still tirelessly slaving away at bespoke gear. Order some, then wile away the hours Houston-style as you idly wonder "What about Schaub?"